Returning to the damp Northwest makes one crave soup. Or perhaps it is the memory of the unbearably cold temperatures we experienced in Atlanta. Whatever the reason, I first tasted this perfect winter “Nip-Nip Soup” my mother-in-law made during our visit to Charlottesville and couldn’t wait to recreate it. It’s a deceptively simple recipe and though its bland applesauce-like texture and color isn’t much to look at, quite flavorful with the creamy meld of sweet, almost cinnamon-y parsnips and the mellowed radish/cabbage taste of the cooked turnips. You don’t even need a formal recipe. 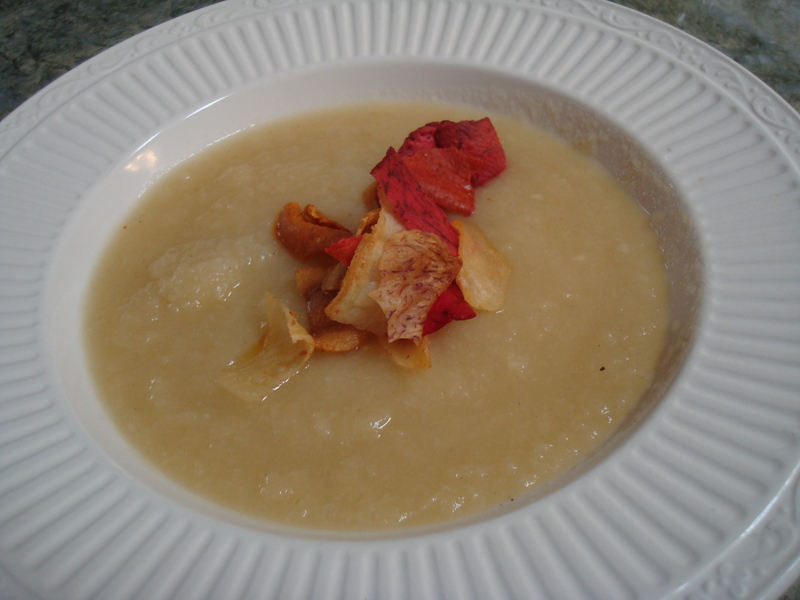 Just sautee onion in butter or olive oil, add equal parts peeled, chopped parsnips and turnips, some wine (I used dry Marsala), cover and steam, puree when vegetables are soft, add broth and blend until soup reaches desired consistency. Stir in some cream to make it extra velvety. Spice according to your taste. The soup did beg for a garnish. Brightly colored Terra Chips lying around did the job. The batch I made out here I plan to dress up with frizzled leeks. But no need to be fancy. I’m sorry to say I don’t know the origin of the recipe, though I suspect it is French. Aunt Amy, who served up the soup to much acclaim years ago, can’t remember where she found it. I didn’t find many similar recipes online. 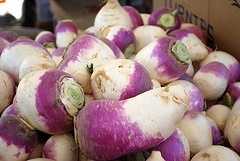 A Massachusetts gourmet store called Russo’s listed a nice one that called for rutabaga (yellow turnip) instead of the standard white with purple blush variety. In ATL, we had a lovely rutabaga and green onion soup at new locavore restaurant Miller Union. Spiced with nutmeg, it made my brother-in-law think of eggnog, or was it pumpkin pie? Russo’s flavors its soup with thyme, marjoram and a garnish of parsley. 3) Add sherry and reduce heat to low. Cover with lid. 4) Steam vegetables until tender. Add up to 1 cup of stock by tablespoons if vegs become too dry, about 45 min. 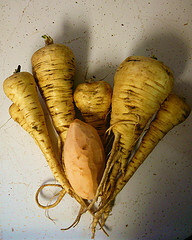 5) Puree vegetables with remaining stock in batches, in processor or with hand blender until smooth.